The National University of Ireland, Cork will this year host GSI's Annual Seminar of the Irish National Seabed Survey (INSS) on 18th November. The annual seminar is now arguably the foremost information and discussion forum for the Irish marine science community. Indeed its sphere of importance is now extending overseas, with a sizeable number of international visitors emerging each year. The 2004 seminar, held in Galway, attracted more than 120 interested parties. This year a welcome reception will be held in the university on the previous evening for early arrivals. The shift in focus from data acquisition to data usage and value added projects, adopted by last year's seminar will be maintained this year. Hence most presentations will outline research projects and industry applications arising out of INSS data. A small minority of presentations will deal with data acquisition in 2005. As usual, the seminar will incorporate an exhibition involving poster displays, video, maps, products and seabed samples. Also, as with other years, a CD-rom of the seminar will be available for distribution shortly after the seminar. Previous year's seminar reviews are available here. GSI has opened a new exhibition which simply, succintly and colourfully chronicles the INSS and its activities. As well as more than 30 colourful information panels we have presentation cases showing rocks taken from the seabed, old scuba diving gear, corals etc. Stunning imagery produced by INSS form the background for the panels with short explanatory text boxes included. Currently resident in GSI's exhibition area it is planned that it will become a roving exhibition through libraries throughout the country. Initially, however it will move to the ENFO office in Dublin for a 3-4 week slot. A calendar showing images of Ireland's 220 million acre underwater territory is now available from GSI. The calendar shows full colour imagery ranging from deep-water coral reefs, to shipwrecks, to sea mounds and sand-banks. It also contains imagery capturing just some of the day-to-day work involved in the mapping of Ireland's offshore. The calendar also includes short text summaries for each month's theme. A limited number of copies are still available free of charge from Enda Gallagher, Tel 01 678 2834 or enda.gallagher@gsi.ie. Pictured on the right is just one of the many stunning images that appear in the publication. The class undertaking the DIT Bolton Street Masters in Sustainable Development Course visited GSI today for an overview of the INSS and its relevance to the promotion of sustainability in marine matters. Over the course of the full afternoon visit GSI staff demonstrated the importance of INSS in terms of environmental management and sustainability. As most of the class had no specific background in marine science they were gently eased into an understanding of INSS by way of a visit to the recently opened INSS exhibition in GSI offices. 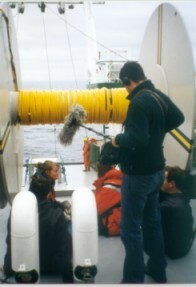 Thereafter they were shown the video documentary primarily shot on board the Celtic Explorer last year, which captures some of the most important aspects of INSS. Finally, the class was treated to a series of presentations. Archie Donovan, Data Manager, provided an overview of GSI, the INSS project and IT matters; Eibhlin Doyle, Senior Geologist, delivered a GIS demonstration combining datasets, and Mick Geoghegan, Project Manager, provided specific examples of the potential roles of INSS in the facilitation of sustainability e.g. fisheries, corals, gas hydrates etc. The event was a success and there is quite a lot of interest among academic groups, in particular, for this kind of overview, but its organisation requires a lot of staff input and unfortunately the INSS team is very lean and stretched. Still, any academic interests could contact us if they would like a similar experience and we will do our best to facilitate. Please contact Enda Gallagher, Tel 01 678 2834 or enda.gallagher@gsi.ie. Femme '05 will take place in Dublin in April 2005. 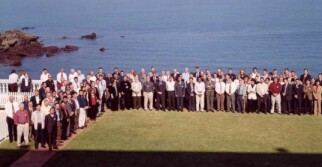 This is the biennial Kongsberg Simrad forum for Multibeam echo sounder system users. The objective of FEMME conferences is to maximize the real-life performance of Kongsberg Simrad Multibeams; in the context of the INSS this objective is of utmost interest to GSI. This is the first time Kongsberg has brought this conference to Ireland, recognition indeed of the international awareness of the importance of Ireland's seabed survey. Interested parties can register and find additional information here. 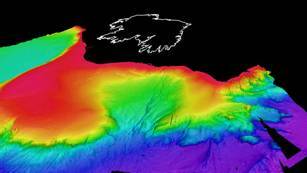 The INSS has announced a call for tenders for the preparation of a review document - "Assessment of the Optimal Use of the Irish National Seabed Survey Deliverables." The report is to contribute importantly to the preparation of a strategy for the next phase of the INSS and towards the development of built-on products and services from the INSS asset. Further details on the tender are available from the government e-tenders website accessible here.